TCU baseball came into the the 2017 season as the consensus No.1 team. That, along with three consecutive College World Series runs, can put pressure on the team to perform. The team has turned to one man to help them keep their minds clear: Brian Cain. Just ask TCU catcher Evan Skoug. Or first baseman Luken Baker. Schlossnagle brought the peak performance coach to Fort Worth to work with the team. Schlossnagle said he values Cain as much as anyone in the program. “He’s instilled a mental game system that helps us play the game one pitch at a time, a system that helps the players be in control of themselves and their emotions,” he said. “We’re firm believers that you can’t be in control of your performance until you’re control of yourself. Cain said his philosophy stems from 12 pillars, including: training an elite mindset, focusing on the process over the outcome and how to recognize when you’re getting out of control. 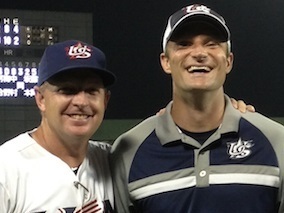 Schlossnagle and Cain have created a culture that can be summarized by the acronym- SEE: selfless, energy and excellence. In addition to culture-building, Cain said perspective-building is the area where he makes the biggest impact. TCU starting pitcher Jared Janczak has flourished since starting in the middle of the 2016 season, being named one of Collegiate Baseball’s National Players of the Week and earning the Big 12 Pitcher of the Week award after a dominating performance against Kansas last Saturday. Janczak decided to stay and redshirt his first year at TCU, and now he’s the ace of the Horned Frog pitching staff. Cain also plays a pivotal part in encouraging successful high school players who don’t taste success at TCU immediately. Chicago Cubs’ All-Star pitcher Jake Arrieta, a former Horned Frog who worked with Cain in 2006 and 2007, is a player that Cain admires more for his work that he put in to earn the 2015 National League Cy Young award than the award itself. Schlossnagle feels Cain helped the team establish routines. Cain said that his partnerships with teams in the college and professional ranks usually come to an end after a few years. Cain’s partnership with Schlossnagle and TCU doesn’t look like it’s coming to an end anytime soon–Cain has worked with the Horned Frogs for over a decade now. Schlossnagle appreciates Cain’s effect on TCU baseball so much that he’s caused Cain to relocate from his home in Vermont to North Texas. Garrett is a Journalism and Sports Broadcasting double major. His passions are sports, God, friends, family, and great food. He loves smiling and living life!